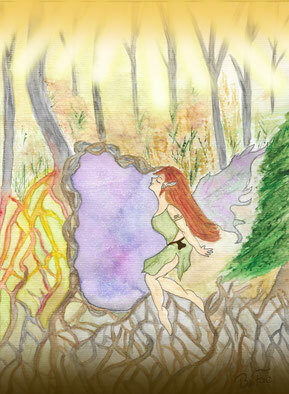 I hope you are all feeling well, and that nobody got scared away when we discussed the dangers in Faery. For this chapter we are going to have a brief look at the Underworld and its inhabitants. When I started this Faery Course I was sure that this will be the biggest lesson of the course, but as I kept doing more and more research about the Underworld I had to come to the conclusion that this topic is so vast I cannot put everything in I want to. So I will focus on the basics, not to confuse or overwhelm anybody, and if you want more information later, you can still do your research. For example R.J. Stewart wrote several books about Faery and the Underworld, as did Orion Foxwood, so maybe you want to get one of these books to dive a little deeper into this topic, but this is of course not a must. Know you can enter the Underworld and practice the exercises just with this lesson. To this day the Underworld seems to have a bad reputation, it is often seen as something dark and unpleasant, at times even evil, or so some religions would have us believe. But even the New Age movement often tends to focus more on elevation, moving upwards instead on focusing on what is below, deep within the planet itself. "We may not think of the land and planet of having separate minds in an exclusive sense, but our own awareness is of the planet, it is a planetary awareness. The underworld is the mind of the planet and is not limited to the parts that we can identify through our self-limited participation." In Welsh mythology the Underworld is referred to as Annwn (pronounced Anoon) which means „the deep place“. The Guardian or Lord of Annwn is Gywn ap Nudd, also sometimes called Arawn, and we will talk about him more in depth at a later point during this lesson. The Welsh Underworld or the Underworld of the Celtic tradition is not a dark place, or a place of judgement, but it was seen as a beautiful place, a place of ease and cheerfulness, a place of a deep connection with the land and its inhabitants like the faeries and even the gods. It is a place of regeneration and transformation. Here is a image that I painted a while ago to represent entering the Underworld. stepping through a frame of roots. Bathing in the light of stars that is hidden deep below. where the golden light fills me with strength. listen to their laughter in the air. so I can show the world my truth. will you join me for this dance?" By all means, I know I'm not an artist, but this image and the accompanying poem describe what the Underworld means to me. When you think about its meaning „deep place“, it may not only refer to deep within the land, or planet itself, but also deep within the human soul and heart, a deep connection towards it that we all can find within ourselves. It is a place of healing and rest. Remember that all growing things are nourished from below, our very existence on earth fails without the life forces that rises from below. The Faery Realm is filled with light, but there is no sun or moon. The light comes from within, the sacred land, the stellar universe within the planet. If you want to take your studies further, you could also read the Mabinogion, those stories tells us of real places that can be found in Wales that gives us access to the Underworld. Some of those places are Dyfed, Harlech and on the island of Grassholm in Pembrokeshire. Underworld, Otherworld, Tir Na Nóg, they all describe a place of Faery however the Underworld goes deeper and interlaces with the Faery Realm they are places of peace and a place of bliss, there was no illness death to time. Don’t let yourself get confused by the different terms. In general these places, however you refer to it, is not a place in great distance, that are unreachable for us in our lifetime, but they are places here on earth. They also reflect our world, or mirror them. The Irish Otherworld, Tir Na Nóg, the land of youth, can be accessed across the sea, it was located in the midst of the Western Ocean. It was a land were the trees were always green and the flowers were always in bloom. The climate is temperate, neither too hot nor too cold. In many stories you can read about how the Irish heroes visiting this land. The Celtic Otherworld or Underworld can be accessed through several different ways; caves, burial mounds, being invited by faery, through a magical mist, and across or under the water are all ways to access the Otherworld, we will discuss the exercises to do so in this lesson. As Gwyn ap Nudd is the Lord of the Underworld and also the King of Faeries, let’s have a closer look at him. Gwyn is translated as „White“, „Fair“, „Holy“, or „Blessed“. Ap literally means son, or son of. Nudd (pronounced neeth) means mist in Welsh, but is also another name for the legendary Welsh hero Lludd Llaw Erient, Lludd of the Silver Hand. Gwyn ap Nudd could then be a god of mist and cloud, but remember that mist and fog are powerful symbols of transition and that they are a liminal state. Just think of the mists surrounding the Isle of Avalon. Gwyn is often seen accompanied by his faery hound the Cwn Annwfn, he is the one who leads the dead to the realms beyond and assists our transformation after death. He is also the leader of the Wild Hunt, soaring over the Welsh hills, taking flight over Cader Idris. He is also the Faery Lord of the forest and you can find him in the wild places and on the hills and mountains. To come closer to him, or closer to any gods of the Wild, it is advised to spend time at the wild places, sleep under the stars, near running water and leave the comfort of our modern society behind, just for a little while. This kind of isolation will help us to become aware of his presence, not only him as a god, but it will also increases our awareness of the Faery Realm. Sometimes it only takes a few hours and we can observe already a shift in our sense of identity, stress will decrease, and we are able to be fully present and we will be grounded, which is so essential for Faery work. As the leader of the Wild Hunt, he is often feared. In Wales for example, it is said that the Wild Hunt is an omen of death. It was said that he and his followers were swirling over Cader Idris, and interestingly it is also said, that they sounded louder the further away they were. In Glastonbury it is also Gwyn who is the leader of the Hunt where he gathers at Glastonbury Tor. In other parts of England, the Wild Hunt was often lead by Herne the Hunter and the Hunt took place in the wild woods rather than in the skies. In northern Europe the Wild Hunt is led by Odin or Woden (Wotan), they took away the spirits of the dead, but they were also accompanied by magical practitioners who may travel with it in spirit returning to their bodies unharmed. The Wild Hunt is also associated with fairies, the Sluagh or Unseelie Court of Scotland, and it is believed to be composed of the spirits both of the ungodly dead and evil fey folk who were cast from the Seelie or noble fairy court for misdeeds. In some parts of Germany the Wild Hunt is lead by Frau Holle, or by Frau Perchta, who led dead children or witches through the sky and it was seen as a good omen of abundant crops in the coming year. Depending on the legend it could be a good thing to meet the Wild Hund, if met politely and bravely it could bring the person a great reward. In most folklore the Wild Hunt takes places during the twelfth night, sometimes also for Samhain. 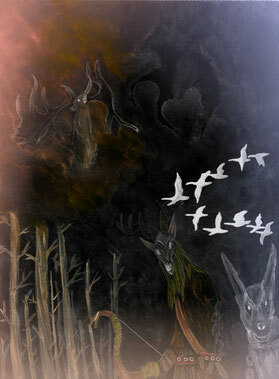 Danu Forest suggests that the Wild Hunt functions as a vast energetic wave sweeping across the land clearing away the dead and any unwelcome spirits, which relates to bringing change and upending structures and bringing chaos to the world, as we can also see in The Tower card from the Tarot. When the presence of the Wild Hunt was noted traditionally it meant that either a death is near or some injustice has taken place. More about the Wild Hunt you can find in the book „Phantom Armies of the Night“ by Claude Lecouteaux. As I mentioned Gwyn ap Nudd is also known as Faery King in Glastonbury, where he dwells in a glas castle within the Tor. You might want to read the legend of Gwyn ap Nudd and St. Collen, or Buchedd Collen, The life of St. Collen. Here we see again, as Gwyn is the Lord of the Underworld, and as King of the Faeries, how the Underworld the realm of the Dead is related to Faery. Maybe Gwyn is not really of your interest, and you want to research other deities of the Underworld to get a better understanding of this realm. Or maybe you just want to go ahead and you are ready to go on a journey with me. 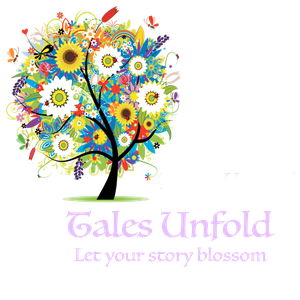 That’s why I will provide a guided journey into the Underworld for you and I want to explain a little how I create them and a general idea on what is important if you travel into the Realm of the Fae. When we want to enter Faery we need to create strong images that have been used over centuries to open the gateway to the Otherworld. The visions you use can also be used in their actual locations, but it is not necessary, however you might want to try this out in the future if you have the option. I will give you a list of a few access points you can use, these are only a few examples and you may want to use something else that works for you. You can envision a mound, a cavern, a well, a burial mound, or a stone circle. Another method you can visualize to enter Faery is to imagine how you cross the waters in a glass boat, or even how you go into a lake, dive deep down and you emerge at the other side. You can also visualize mist and how you go through it to enter the Otherworld. A visualization that I like to use to enter the Underworld, which is also a part of R.J. Stewart’s exercise, is to imagine a round door appearing on the ground through which you can enter. As you will see later, I use this image also for the journey that I provide for you. When you visualize a door appearing, always make sure it disappears back into the earth at the end of your journey. I will also use the same call back sign as in the previous journey; a bell that rings three times will indicate that it is time to come back, but no need to rush I will give you enough time to say good by and to prepare yourself to come back. I would suggest that you use the guided journey a few times, until you are familiar with the process. If you don't feel ready to travel all by yourself, invite your Faery Guide to accompany you. You can use any kind of music, something that doesn't distract you, maybe you just want a steady drumbeat, I’m sure you can find something you like. But maybe you don't need any music, and when you are outside for this journey, you can just listen to the sounds of nature. - Always start by grounding yourself and give yourself time to become still. I hope this is helpful if you have any further questions feel free to contact me. Here is you guided journey into the Underworld, and never forget, even if we take this seriously you are allowed to have fun with this.